One of the unexpected highlight of the Dive Seafari trip is being housed at The Peacock Garden Luxury Resort. This secret hideaway is tucked in the middle of Baclayon about 15 minutes from Baclayon church and Tagbilaran airport. The scuba diving part is in Panglao Island, about 45 minutes away (26 minutes was our record). “So we have to commute to and back the dive shop everyday?” this was swimming in my head before we arrived. But the moment the heavy wooden gate opened, unveiling the huge property it conceals, we were stunned for a few. And someone breathe out, “what the hell?” It could’ve been me. But let’s say world travelers Bob and Gutsy were impressed too. The Peacock Garden Luxury Resort is a 40-room boutique hotel with all the luxurious amenities you need to be in recluse: fine dining European restaurant, wine cellar, a Roman bath inspired spa, infinity pool, dark wood-big couch cigar room, an entertainment “disco” room that doubles as ktv on some nights, a huge 11-hectare open space for you to get lost without really getting lost. Or you can take one of their buggies and get lost in the mountain. Everything in this hotel exudes old world, rich, and extravagant. The room (which I spend most of my time in) is huge, fitted with 12-inches king size mattress sitting on solid wood frame. The sea view room has a pocket balcony where you have the infinity pool view and the sea beyond. It’s totally amazing to look out in the evening. I don’t watch television but they have 32-inches flat screen tv for those who can’t live without one. I was a little bit disappointed with the intermittent internet because I was expected to put a daily update for Dive Seafari, but the resort was very apologetic and the owner/general manager Chris Schoof called me up personally when the service was back. Talk about valuing customer. It’s called the Old Heidelberg and it’s our 2nd most visited place in the resort. As much as possible, we took all our meals here. It’s the best restaurant in the whole wide world! No, kidding aside, the food here is REALLY good. I’m not rating it according to provincial standard. The food there is so fine, it’s better than many fine dining restaurant in Manila or the world, actually. Their world class chef had served in many fine hotels around the world and cooked for Nelson Mandela and Muhammed Ali. 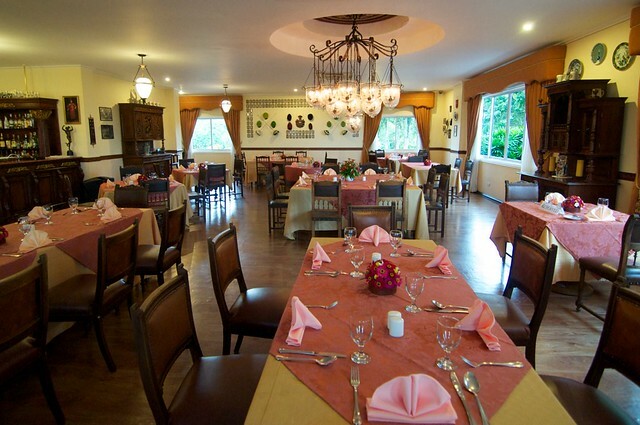 The Old Heidelberg cuisine is basically European, minor focus on German dishes since the owner is German. But the menu is vast and what we find most impressive is that, for 6 days, the 3 of us taking our lunch and dinner there, not one time that something we ordered is out of stock! And it’s not like we order bread everyday. With 3 of us, we probably covered the whole menu including salads, soup, desserts and the wines! And every time, it’s available, and it’s perfect! I wish I took photos of the food, because that’s what bloggers do. But I really don’t take photos of food much, because normally it’s the last thing on my mind when food arrives–unless it’s bizarre. But let me try to explain the experience biting into my favorite dishes. The Grilled Halibut is my favorite. I had it twice during my stay. This now kicked the Chilean Seabass in Circles (Shangri-la Makati) out of my #1 list of favorite dish ever. It was so fresh, you think we’re in Alaska and it’s the catch of the day. Seared so perfectly that it’s fully cooked and hot, but still tender and together. It melts in your mouth, not crumble in your fork. The serving is very generous too considering it’s price tag. The Veal Cheek on my last night upon Amanda’s recommendation and it was so good!!! It was very tender like biting on soft bread. The red sauce was flavorful enough without being salty. Oh, oh, I have to commend the perfectly light and crisp croissant we had everyday for breakfast! It’s like walking into a French bakery in the morning in France. The Peacock Garden Luxury Resort is owned by Mr. Schoof who hailed from Germany. Traveling around the world on a backpack in his youth, he found his way to the Philippines and was totally enchanted by the hospitable people, particularly the Boholanos, and more specifically the now Mrs. Schoof. His family is in automobile business in Germany, hence the great interest in cars. A Porsche Cayenne and a BMW sports car is a regular sighting at the resort’s reception. And there’s a collector’s Bentley in the family house. The Peacock Garden brought together Mr. Schoof hedonistic indulgence. With this, he combined old European charm with Filipino hospitality. I have to stress that the service here is impeccable! The staff who are all locals of Bohol, are well trained to be sensitive to the needs of the guests. When I was doing the resort tour in the afternoon on my gas off day, I saw the staff at the restaurant having a small meeting and self training. It’s really impressive. The peacock is a perfect representation as it has long been a symbol of East meets West. In the olden days, the peacock, an exotic animal from India, are imported to Europe by the really rich as an evidence of their wealth and taste for finer things. The resort’s concept of combining western taste with eastern hospitality, and that Mr Schoof, a westerner, marrying to the East. It’s just can’t be more suitable and perfect. It’s inevitable to notice the artifacts displayed all over the resort–the restaurant and all the hallways. These are private collection of the Mr Schoof, which he gathered over the years of travels. They are now brought in to his new home here at the Peacock Garden Luxury Resort. He’s a big Jose Rizal fan and owns one of Rizal’s sala set that is now displayed in a corded area of the Old Heidelberg restaurant. And all the chairs in the restaurant is imported from a castle in Germany. It’s a crazy place like that, you have to go see it for yourself. They officially opened in 2009, with soft opening in 2008. If you wonder why you’ve not heard of it before, it’s because the owners want to do things slowly but surely. They don’t have a background in hotel operation (but they do in running a restaurant) and are actually learning things along the way. Chris and Amanda, who now run the company are young, vibrant, full of ideas, and hard working! They attend to details and don’t do short-cuts, so I have no doubt they will go very far and succeed in their venture. You will definitely hear and see more of them in the coming months. I totally recommend this place! No need to spend a fortune abroad, PEACOCK GARDEN, it’s a PARADISE and Luv it! My husband and boys enjoyed these holidays. Rooms and services – no problemo, staff and crew, excellente! You can find the sofa of our dear hero, Dr. Jose Rizal, it’s something different….. and feels like your in Germany! Thanks to the creators of Peacock Garden! May you have many more blessings and God be with you always! I wish to have another honeymoon with my husband and this seems like the best place to do it. I do wish there are trip packages that includes Peacock. That place looks and sounds fantastic. I’ll have to plan my long-awaited dive trip to the Philippines (whenever that may be!) around a visit to Peacock Garden! So this is what I have been missing! I have ready about this place but honestly thought it was a “pretentious” place given its Euro-decor. I will take your word for it and try it sometime. Looking forward to staying or at the very least, dining there. Do tell, how pricey is it? 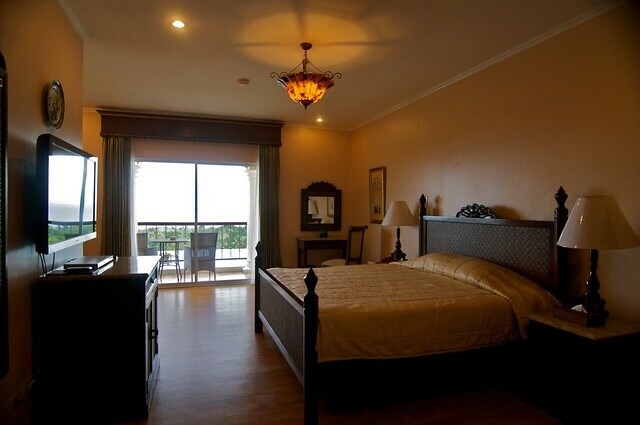 The rate of the seaview rooms is between 9,5-10,5k per night with the beautiful breakfast. Dining is very reasonable. Imagine eating at Fridays or Chillis and the food that tastes 200x better! Go! I won’t miss it in my next visit! Thanks. I stayed at The Peacock Garden for three weeks and never wanted to leave. Excellent service, sumptuous dining, and of course the staff are some of the most wonderful people in the world! 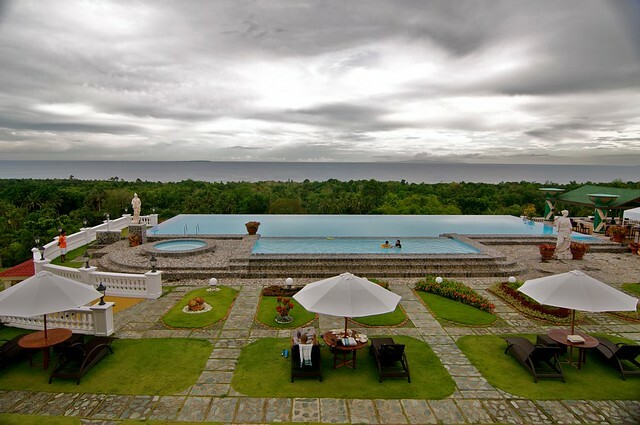 Chris Schoof and Amanda Iliscupides have transformed Bohol into a world-class destination. 3 weeks is worse than 1 week to get back to reality. :) You’re the guy who made Amanda’s Illustration. She told me about you! Cool work! Great article and I totally agree with you 200%. No place can have a service that is totally the Peacock Experience for me whenever I am in Bohol. Even with all the exemplary things around the resort, it still feels like home to me. The service impeccable. Staff super trained and always at your service. It’s out of this world indeed. I’ve stayed in several up scale resorts before but in here, they’re so genuine! Even the owners are so friendly and at your service. They act like they’re not gabajillionaires.